With summer emerging in Minneapolis, grilling season is finally here! 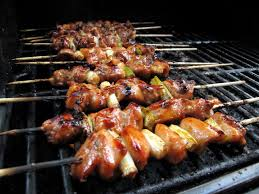 Many of us enjoyed our brats, burgers, and beverages over Memorial Day weekend, but who can say that they have Japanese Yakitori simmering on their charcoal grill? United Noodles is hosting its first-ever Six Saturdays of Grilling event, a unique opportunity to learn Asian grilling recipes that will enrich your outdoor cooking experience and impress your friends and family! The team at United Noodles will fire up the grill outside the front doors each Saturday from May 24 through June 28. The grilling crew will be pulling from traditional Japanese, Thai, Vietnamese, and Korean recipes and grilling techniques to spotlight the various types of delicious cuisine to be enjoyed all summer long! Join in the fun by enjoying samples, learning new recipes, and receiving special discounts on grilling ingredients. Hope to see you Saturdays between 11:00am – 3:00pm. United Noodles is located at 2015 E 24th Street off of Minnehaha Avenue. For further information, check out their Facebook page here.